This review is going to get a little wordy. Not only am I telling you all about Great Little War Game, a fantastic turn-based strategy game from Rubicon, I also get to tell you all about the upcoming 1.4 update. So if you’re short on time and you want the summary, let me just say that this is a game you need to own if you like turn-based strategy, and the update is going to make it better than ever. I’ll call Great Little War Game “great" without hesitation, but I’d hardly call it “little" – not with 20 campaign levels, a 10 level IAP expansion, and tons of maps for pass-and-play multiplayer and AI skirmishes. 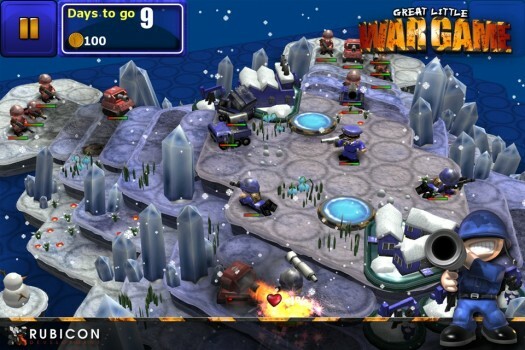 This isn’t a game that’s over quickly – the levels take time and multiplayer matches can turn into all-out war. The campaign gives you a thorough introduction to the game’s many units, from the humble Engineer to mighty tanks, warships and aircraft. Early on, you learn the simple controls – tap to select and move, hold to see range and movement – and then then you’ll learn to capture the enemy’s resources and base. You’ll also need to pick up vital strategies like holding high terrain, defending your resources and picking the right spot to lay an ambush. You’re set against enemy forces controlled by an AI that poses a challenge without becoming frustrating. In each level, you’re facing ongoing assaults by the enemy while you try to achieve a goal. Sometimes you need to capture the enemy base. Other times you’re left to hold out against a superior foe or to struggle to build up your resources before being overwhelmed. Your performance is ranked on how quickly you succeed. 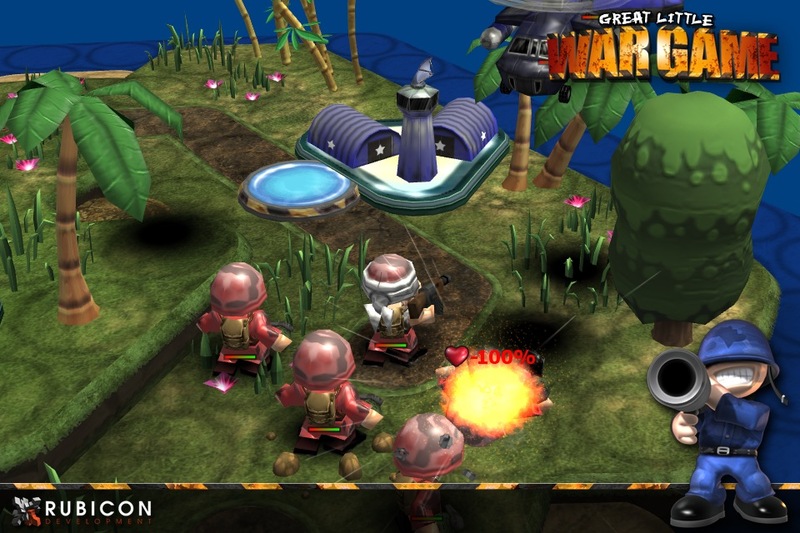 Great Little War Game isn’t just an impressive strategy game; it’s also pretty darn funny. The cut scenes between levels feature your army’s Generalissimo and his terribly courageous approach to warmongering. I’ve never seen someone lead so bravely from the (distant) rear. Unit voices, animations and descriptions also offer up some laughs. I’ve had a chance to go hands-on with the upcoming 1.4 update. It’s going to be submitted Friday, so hopefully we’ll see it soon. The biggest change is the addition of difficulty modes. You’ll start on Basic difficulty, and there are three higher modes to unlock by beating the campaign with each. Damage increases for both sides as you play on higher difficulties, so you’ll need to be very careful about keeping your army safely out of range while picking off the enemy. The AI also gets more cash to spend, and it’s a little smarter in all modes, so skilled players are going to be challenged. Great Little War Game is also getting a cosmetic bump, with improvements to lighting and water, multisampling and bump maps. It looks very nice – still cartoony, but much more polished. Despite the nice new look, 1.4 feels snappier than ever on my 3GS. As for the one thing some of you have been holding out for – the game’s 16 achievements now sync to Game Center. Three new skirmish maps have been added (including a sweet little nod to this site). On top of all that, there’s a new 15 level campaign, Holiday from Hell, available for in-app purchase. Rubicon’s always been very responsive to their fans, adding fixes and updates based on feedback. They’ve adopted a lot of ideas from users on our forums, so if you’ve got any suggestions, make sure to stop in. One technical note: the game only supports third-generation devices and newer. Also, be sure to grab the right version. With an HD version, a standard version, and a lite version for each, things can get a little confusing. The HD is Universal with Retina graphics, while the standard version has neither feature. I do like the recent trend of releasing a second version that’s a Universal HD, but restricting Retina graphics to that version is less awesome. 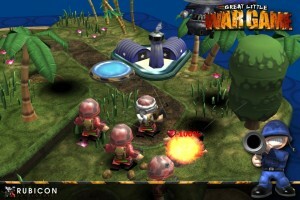 Great Little War Game is the kind of game you can really sink your teeth into, which is rare enough. So I’m delighted to discover that it’s also rich in features, good looking and full of humor. With the 1.4 update, it’s going to be even more of a must-buy. I’ve got my fingers crossed for asynchronous multiplayer, a feature Rubicon hopes to include some time in the future, but in the meantime there’s quite the bounty to enjoy.